This holiday home is part of a partly 15th and partly 17th century 'bastide', which has been restored with great care. You will be staying in the 'gîte', the rest of the bastide is unoccupied. The decor is well-kept and, because the original features have been preserved, it gives you a taste of the authentic atmosphere. The spacious walled garden has a long dining table and there are many shady nooks with seating areas. The house has a patio with a BBQ. A second patio can be found at the front of the house. There is a path from the garden to the swimming pool with its surrounding terrace with four sun loungers. You have a view of the Ardeche Valley and the Tanargue Mountains. From the garden you walk through the cherry and peach orchards straight into the forest. The bastide is located in the hamlet of Les Barras, 1.5 km from Vesseaux. The fortified city of Aubenas (5 km) is situated on a hill along the Ardeche River and has a charming old center. 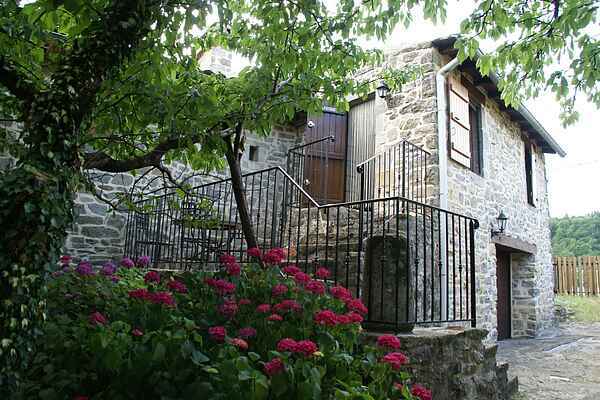 You can also taste the medieval atmosphere in the characteristic villages of Antraigues (18 km) and Vogue (14 km). The village of Baluzac (21 km) is one of the hundred most beautiful villages in France. This holiday home is suitable for 2 adults and 3 children.